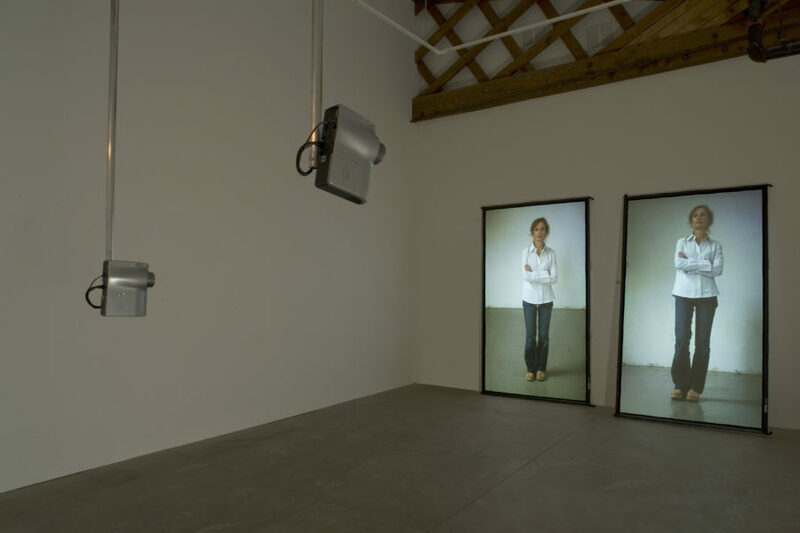 Together with the work entitled Loop Through, 2005, Is a Bell Ringing in the Empty Sky was originally produced for a retrospective tribute for the actress Isabelle Huppert. The work was recorded in high-definition video using a vertical format (the cameras were rotated 90 degrees). 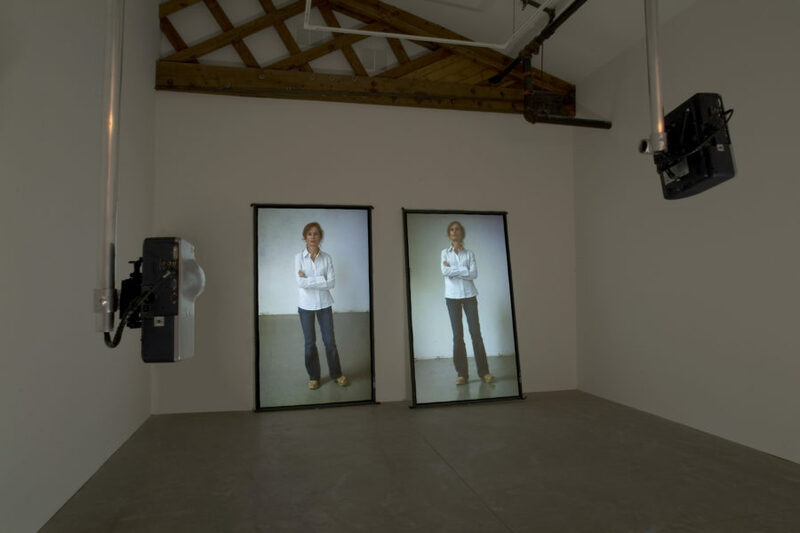 Two screens, each measuring approximately 96 h. x 54 w. inches, lean against the wall, one almost up against it and the other with a little more angle—suggesting something like a large dressing room in a photo or dance studio. The two full-bodied images were recorded simultaneously and consist of Isabelle Huppert standing and looking at an invisible point positioned between the cameras. One camera looks down from a position slightly above the head and the other looks up from about thigh high. 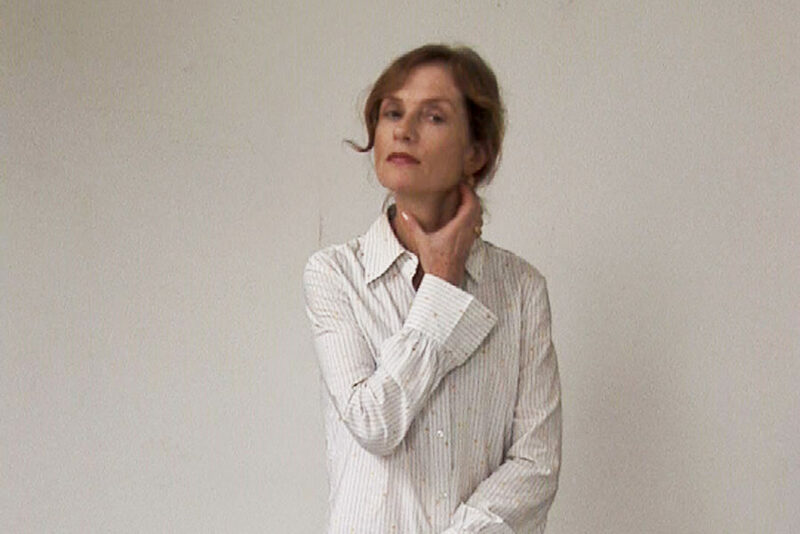 Huppert becomes a portrait in motion, fluctuating between “herself” and “acting,” where a rush of subtle changes of behavior and emotions are revealed: discomfort, intensity, boredom, playfulness, annoyance, agitation, coyness, etc. “Woman of Many Faces: Isabelle Huppert,” P.S. 1 Contemporary Art Center, Long Island City, New York, October 30 – December 5, 2005. 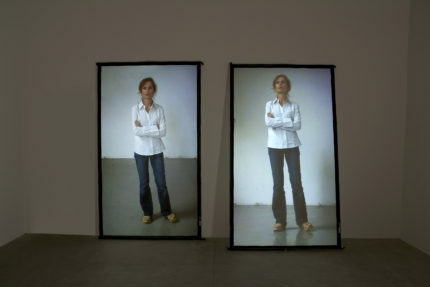 “Isabelle Huppert: la femme aux portraits,” Couvent des Cordeliers, Paris, France, January 9 – February 25, 2006. “Expanded Cinema,” MMOMA (Moscow Museum of Modern Art), Moscow, Russia, June 13 – July 24, 2011. "Gary Hill: glossodelic attractors (part two)," Henry Art Gallery, Seattle, WA, August 20 – September 16, 2012. Quasha, George and Charles Stein. An Art of Limina: Gary Hill’s Works and Writings. Barcelona: Ediciones Polígrafa, 2009, pp. 437, 444, 582, 584. Gary Hill: Viewer. Moscow: GMG Gallery, 2010 (in Russian and English), pp. 32, 33.